A few weeks ago, Standard and Poors released their monthly Case-Shiller index, showing continued weakness in the housing market. The graph on page 1 charts the year over year percent change in housing prices for 20 cities in the U.S. After rising above 0 in the early part of 2010, the index has now taken a dive below 0, indicating increased price pressures from foreclosures and a labor market that is still far from healthy. Let’s step back and look at another data series, an index of housing prices from the Federal Housing Finance Agency, which compiles data from Fannie Mae and Freddie Mac purchases and refinances. The large volume of mortgages guaranteed by these two quasi-governmental agencies provides an annual data set of more than a million mortgages, 60 times larger than the Case-Shiller data set that usually makes headlines. 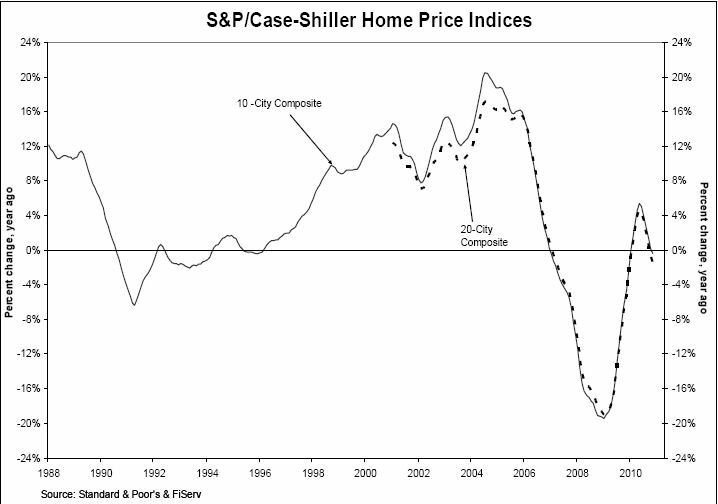 Spotting trends in stock prices or housing prices is more art than science. 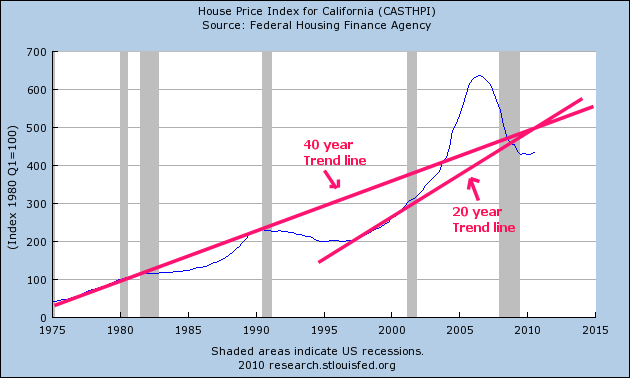 Below I’ve drawn my guesstimation of the 40 year and 20 year trend lines in the California housing index. As a comparison, let’s look at a more even tempered state, Colorado. (Source) Here we can see a more sustainable growth pattern in prices. Again, I’ve drawn a trendline in red to show a guesstimation of the long term trend. A comparison graph of the two states reveals just how strongly the California index shot up during the past decade. The scales are different for each state but reveal interesting historical patterns and a caution to California homeowners. 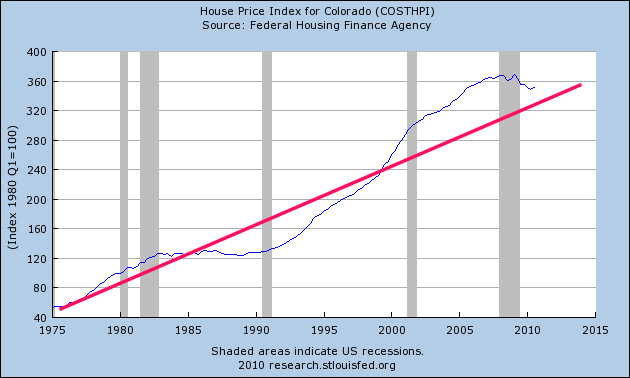 Colorado experienced little growth in housing prices during the 80s. For Californians, their slow growth period was from the late 80s to the late nineties. During the late nineties and early part of the 2000s, the growth pattern was similar to Colorado. 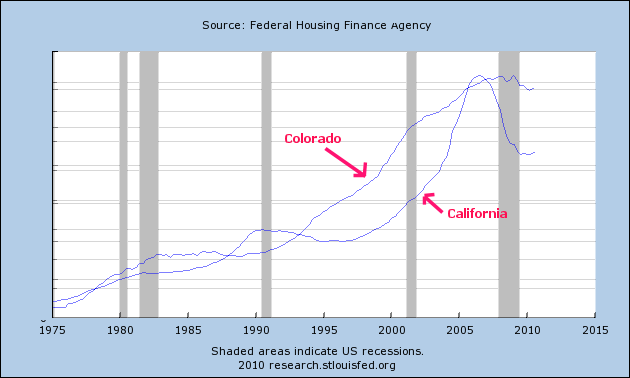 After the recession of 2002-3, California housing prices exploded upward while Colorado prices maintained the same growth pattern. 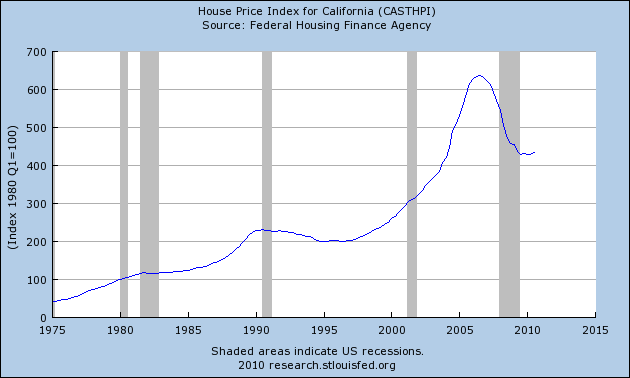 During the past two years and over the next several years, California prices will continue a painful return to the long term trend. Colorado homeowners will see the same flatlining of prices that they experienced during the 80s but that is far better than the rollercoaster ride that California homeowners are currently on.